Have you ever wondered how is to walk through a forest floating on the snow? 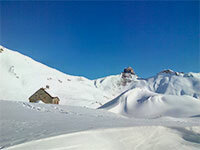 Easy Snowshoe routes near Madrid for the whole family or large and challenging tours in the Pyrenees, Sierra Nevada or Gredos. 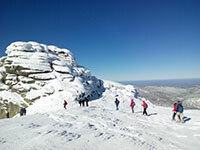 Come with Patagonica and discover the incredible world of snowshoeing. 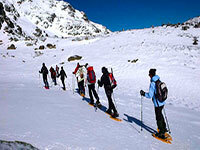 Discover , close to the capital City, the magical pine forests of the Madrid Mountains range with our snowshoes tours. 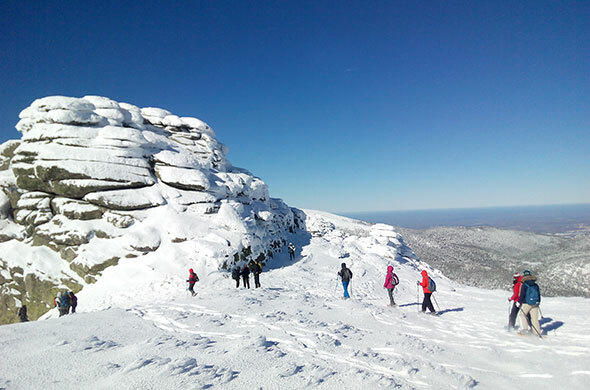 Snowshoe hikes near Madrid to enjoy with the whole family and ascents to Peñalara (2.428 mts - highest peak in Madrid), Montón de Trigo (2161 mts) or maliciosa (2227mts) for the more adventurous. individual gear: Snowshoes, trekking poles. Benasque valley close to El Aneto (highest peak in Aragón) or the surroundings of the Midi d'Ossau peak are some of the scenarios that we have chosen for you this winter. Lets walk and discover with Patagonica unique places in the wonderfull Pyrenees Valleys. Honoring its name (Snowy Sierra), the highest massif of La Peninsula located in the South of Spain offers good weather most of the winter season and well worth a visit, when it is covered with a white mantle and allows us to enjoy pleasant walks with our snowshoes on a sunny day.